The legal team for Americans for Safe Access won the first round this month in their fight to protect the right of California patients to organize as collectives for cultivation. A strongly worded ruling from Superior Court Judge Barbara Roberts on September 6 found that that seriously ill patients cultivating collectively "should not be required to risk criminal penalties and the stress and expense of a criminal trial in order to assert their rights." The ruling came in response to an attempt by Butte County to stop the lawsuit ASA filed in May 2006 on behalf of a seven-person private patient collective. "The court has sent a clear message to local law enforcement in California that they must respect the rights of patients to cultivate collectively." said ASA Chief Counsel Joe Elford. At issue is a September 2005 warrantless search of a patient's home by the Butte County Sheriff's Department, during which David Williams, 54, was forced to uproot and destroy more than two dozen plants or face arrest and prosecution. "We were told that it was not lawful to grow collectively for multiple patients," said Williams. Judge Roberts' ruling also rejected Butte County's policy of requiring all members to physically participate in the cultivation, thereby allowing collective members to "contribute financially." "The next step is to show that Williams was running a valid collective," said Elford. "At that point, the court is expected to make a final determination consistent with yesterday's ruling, which strongly vindicates the right of medical marijuana patients to associate together to grow the medicine they need." ASA's intervention came after repeated reports of unlawful behavior by Butte County sheriffs and other law enforcement agencies. ASA lobbying was part of a successful, many-month effort by medical marijuana activists to get Congress to support research into cannabis therapeutics. On September 19, a letter signed by 45 members of the U.S. House of Representatives was delivered to the U.S. Drug Enforcement Administration (DEA), urging the DEA to allow a UMass-Amherst professor to grow marijuana for approved research studies. Over the past four months, ASA National Office staff, led by Governmental Affairs Director Caren Woodson, have been part of a campaign to get members of the House to sign the bi-partisan letter to DEA Adminstrator Karen Tandy. ASA members across the country contributed to a national grassroots campaign, contacting their representatives to ask them to sign on. The letter, which was authored by U.S. Representatives John Olver (D-MA) and Dana Rohrabacher (R-CA), asks Tandy to accept DEA Administrative Law Judge Mary Ellen Bittner's February 2007 Opinion and Recommended Ruling in support of the UMass-Amherst Medical Marijuana Research Production Facility. The law judge's ruling is non-binding and DEA has no deadline to decide whether to accept or reject it. The ruling is the result of legal action sponsored by the Multidisciplinary Association for Psychedelic Studies and supported by the American Civil Liberties Union and other drug policy reform groups. The DEA's handling of the UMass application to cultivate marijuana for research studies has already elicited congressional questioning. A DEA deputy administrator faced criticism on the subject during hearings this summer. "The DEA is ignoring the vast scientific evidence that clearly shows medicinal use of marijuana benefits patients who are extremely ill," said Rep. Jerrold Nadler (D-NY), who sits on one of the committees charged with oversight. "When it comes to providing the best treatment options to sick Americans, we should trust doctors and medical researchers and not federal bureaucrats." Lyle Craker, who is the director of the Medicinal Plant Program in the Department of Plant, Insect and Soil Sciences at University of Massachusetts, Amherst, submitted his initial application to DEA in June 2001. Craker plans to cultivate marijuana that would be used in clinical trials to determine whether marijuana meets FDA standards for medical safety and efficacy. Since 1968, the federal National Institute on Drug Abuse has maintained a monopoly on the supply of research marijuana. Judge Bittner found that NIDA has repeatedly refused to supply marijuana for FDA-approved studies that could develop marijuana as a prescription medicine. Federal law requires adequate competition in the production of such Schedule I drugs as marijuana, to ensure a supply for approved research. Members of the leading organization for seniors, the American Association of Retired Persons (AARP), had the opportunity to speak with ASA staff members during the group's convention in Boston from September 6-8. More than 25,000 people attended the AARP's annual event, with an average age of 62. "Meeting so many older Americans who are interested in how medical cannabis can help them was a great experience," said Caren Woodson, ASA's Director of Governmental Affairs. "We know from the AARP's own polling in 2004 that the vast majority of their members believe in making access safe and legal. We had an overwhelmingly positive response, not just from baby-boomers, but from the "depression era" generation." ASA sponsored a booth where AARP members could pick up information about medical marijuana, including condition-based booklets on aging, which can be seen at AmericansForSafeAccess.org/Aging_booklet. 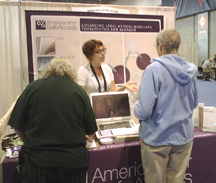 The booth also offered ASA gear and ways for seniors to plug in to medical marijuana activism. Last month's Retirement Living TV program on medical marijuana was featured, as well. "There was a lot of interest about ways to ingest marijuana without smoking it, and people were generally surprised by how much progress we have made in 10 years," said Woodson. "We also heard some heartbreaking stories about loved ones with cancer and how much they would have liked another option for pain and wasting." The broad-spectrum therapeutic nature of cannabis makes it a good choice for many people with a variety of conditions, such as arthritis, chronic pain, gastro-intestinal problems, and movement disorders such as Parkinson's. With cancer more prevalent with aging, the well-established benefits of cannabis for coping with the devastating side-effects of chemotherapy are also of interest to older Americans. On September 19, a leading physician specializing in cannabis therapeutics gave a workshop for more than 200 doctors. The Continuing Medical Education (CME) workshop on medical marijuana was the first hosted by Kaiser Permanente in San Jose. More than 200 physicians attended the workshop conducted by Dr. David Bearman and coordinated by Americans for Safe Access. Dr. Bearman’s presentation covered the history of medical cannabis, an overview of its many benefits, and the legal rights of physicians. Dr. Bearman is a well-respected physician with extensive experience in public health. A graduate of the University of Washington School of Medicine, Dr Bearman was the Director of Medical Services for the Santa Barbara Regional Health Authority (SBRHA) since its inception in 1983 through June 1997, when he became Senior Health Care Advisor/Grants Development Director. He has a long and illustrious background in the field of drug abuse treatment and prevention, including serving as Medical Director of Santa Barbara County Methadone Maintenance Clinic and Ventura County Opiate Detox Program; teaching courses on substance abuse at UCSF, UCSB, and SDSU; and authoring numerous articles on drug abuse treatment and prevention, as well as other medical topics. His articles have appeared in the Journal of Psychoactive Drugs, the Harvard Business Review, and other publications. ASA plans to continue educating Kaiser physicians, as well as those across California and the rest of the country, in order to counter the misinformation spread by the federal government. Eventually, ASA hopes to have a CME available that can be downloaded by physicians online. Contact Candidates: Demand Action on Safe Access! Will you pledge to end the gridlock and lift the federal government's monopoly on the supply of marijuana available for research? If elected, will you seek a comprehensive change in federal policy to resolve the differences between state and federal laws? If elected, what specific actions will you take to ensure that the Department of Justice, the DEA, and other federal agencies are not working to undermine state medical marijuana laws on your watch? If elected, will you consider granting Presidential pardons to medical marijuana patients and providers who have been sentenced to lengthy federal prison terms who were abiding by state law? See AmericansforSafeAccess.org/08PresidentialCandidates for contact information on the candidates. For more help, contact Sonnet: Sonnet@AmericansforSafeAccess.org.